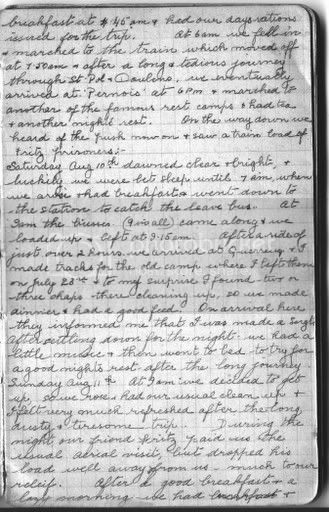 Friday Aug 9th broke in upon us rather roughly as we were rudely awakened at 4am & after a wash etc, were given our breakfast at 4:45am & had our days rations issued for the trip. At 6 am we fell in and marched to the train which moved off at 7:50 am & after a long & tedious journey through St. Pol and Doulens, we eventually arrived at Pernois at 6 pm & marched to another of the famous rest camps & had tea & another night's rest. On the way down, we heard of the push now on & saw a train full of Fritz prisoners. Wednesday Aug 9th. Again, I awoke at 6 to the sound of blue wrens outside; I could get used to that. Very cool and crisp. Attended my appointment with Mum's GP and got the full information on her medications, discovering in the process that there were two that she did not have in stock; luckily, they were not vital to her continued well-being. Filled the two 'missing' prescriptions, and discussed options for better management of Mum's medications with the pharmacist. Will follow-up next week; it seems that the pharmacy can hold her authorisations, and remind the doctor when there are no repeats left current.